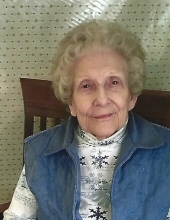 Marjorie Mae (Howe) Howard passed from this earth, Friday, February 8, 2019 at Windridge Nursing and Rehab in Miami, OK. She was 88. Marjorie was born June 6, 1930 in Salina, OK to Alva and Alma (Hollister) Howe. She had lived in Miami most of her life. She worked at the B.F. Goodrich cafeteria and did babysitting in her home. She married Lawrence (Fuzz) Howard June 6, 1952 and he preceded her in death, she was also preceded by her parents, 3 brothers, Richard Howe, Charles Howe, and John Howe and 1 sister Wanda Howe Huft. Marjorie is survived by 3 sons, David Howard and wife Janet of Miami, OK, Tom Howard and wife Linda of Tuscaloosa, AL, Tim Howard and wife Malinda of North Miami, OK, 1 brother Warren Howe and wife Darlene of Bradenton, FL, 1 sister Gwen Howe Knight of Norman, OK, 7 grandchildren Danesa, Kim, Chad, Kristen, Calvin, Charles and Sarah and 11 great grandchildren. She loved her children, grandchildren and great grandchildren; she always made sure she had cookies for them. Marjorie was the best Christian woman, anyone who knew by the example she set. She always treated her daughter in laws as her daughters and had a big heart for such a small woman. She loved studying her Bible and going to church and was long time member of the Miami, OK Church of Christ. She served in the Army for a short time and will be greatly missed, but glad she can be in her heavenly home. To send flowers or a remembrance gift to the family of Marjorie Mae Howard, please visit our Tribute Store. "Email Address" would like to share the life celebration of Marjorie Mae Howard. Click on the "link" to go to share a favorite memory or leave a condolence message for the family.